Dreamhost Webhosting is officially recommended by WordPress hosting page. It’s voted the best web hosting service for 3 Years in a Row and it’s the best choice for your WordPress site. DreamHost is happily hosting more than 1.5 million websites and blogs. Let me give you a brief on Dreamhost ‘s plans and packages before I share this special Dreamhost discount. There are only a few web hosting services that really impressed me. Since I create most of my blogs on the WordPress platform from the past 5 years. I have tested and used many web hosting services such as Dreamhost, Siteground, Hostgator and Bluehost. Dreamhost always stands out as a winner of WordPress hosting, and the key to its success is the optimization of its servers for WordPress. In addition, for a beginner who is searching high-quality web hosting within a budget. Then Dreamhost web hosting is for you as it provides both. In this article, I’m sharing special Dreamhost discount which will allow you to save $ 50 but wait if you are planning to host only 1 one website with low traffic and have no plans to host more websites in future then Shared Starter plan will be right for you. It’s a great place to start! 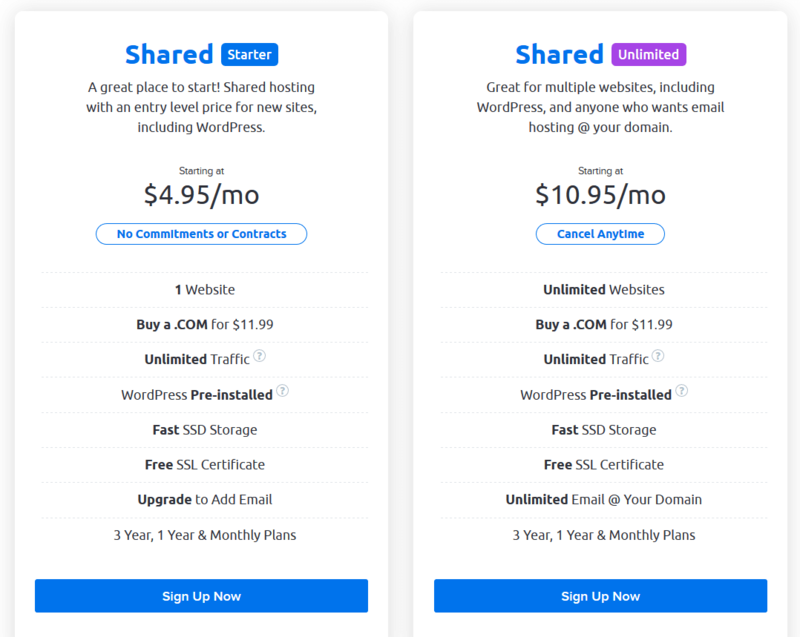 Shared hosting with an entry-level price for new sites, including WordPress. My recommendation would go for Dreamhost Unlimited package for 2 or 3 years term. Higher the term plan will be, you will get more saving. Now, let’s discuss some of the Dreamhost’s hosting features that make it worth buying. For that Dreamhost has added solid state drives (SSDs) to shared hosting to help your sites succeed; pages now load 200% faster, making it the quickest and most affordable way to get your website online. There shared hosting plan supports any kind of site including blogs, portfolios, business sites, online stores and even complex database-driven sites. Did any host really provides Unlimited Storage & Bandwidth ? No blogger will ever tell us this but reality is if your site isn’t well optimized and is causing issues for others on your shared server (either because it’s pounding the CPU, hogging RAM, or doing tons of disk I/O), you may be asked to sign up for your own DreamHost Private Server. And trust me , every host out there has exactly the same limitations. I am just trying to be up front about them ! However Unlimited Policy no longer apply to any DreamPress accounts, nor to VPS machine because disk allotment are listed on the sign-up page for each VPS and DreamPress plan offered. In general, it means there are no limits on the disk space or data transfer in the hosting plans and 100 % of all customers can have more than enough disk space, and bandwidth to meet the actual needs like publishing posts with images, presenting optimized images, publishing resumes, introducing companies, selling products and services, etc. It is not appropriate for customers who utilize hosting service for abnormal usages like very heavy file storage. Within a single account, you can host and manage as many websites and domains as you like. Yes, all for free! You can install WordPress on your web hosting account automatically with one-click worpress installer. Dreamhost hosting plans are backed by there in-house customer support team. Customer support is available 24/7 and 365 days via email, live chat and Twitter. Dreamhost is so confident that you will like there shared hosting service otherwise they will return all of your money if you cancel within the first 97 days. Creating email addresses, creating MySQL datapoints, access your accounting information, contact technical support and more via there easy- to- use Web-based control panel. You can get the maximum discount with this Dreamhost discount link. This link offers a discount of almost 40 per cent. Remember, your only chance to save money is on your first bill, hosting the renewal is not discounted. Make the most of this unique Dreamhost deal and save as much as possible.